Save $10 Off MSRP Plus More Discounts on 2 or More Jars! 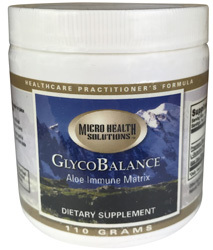 GlycoBalance™ Aloe Immune Matrix with L-Glutamine, manufactured by Micro Health Solutions, provides more benefits than the original GlycoBalance Glyconutrients formula! This product has been reformulated to provide a more potent and concentrated composition which means less amount is required to achieve positive results. GlycoBalance is for the whole family. From children to grandparents and everybody in between. GlycoBalance can even benefit your pets. Other Ingredients: Stevia extract powder 200:1 and natural citrus powder. Contains no added sugar, starch, preservatives, artificial colors, flavors or additives, corn, wheat, yeast, soy or dairy. Suggested use: Take one scoop daily with water or juice or as recommended by your healthcare provider.